The following article was distributed as an Internationalist Group leaflet at an April 6 conference of Socialist Action and Youth for Socialist Action at the University of Connecticut. For years, Socialist Action mimicked the Solidarność logo in the masthead of its paper. The reformist left in the United States is in profound crisis. The International Socialist Organization has spectacularly imploded and voted to dissolve, Socialist Alternative has lost a huge chunk of its membership and numerous branches, Workers World has been ripped apart by multiple splits and expulsions. A key element has been the impact of the “#MeToo movement” on left groups that proclaim themselves feminist. But behind it is the explosive growth of Democratic Socialists of America (DSA), which has left the rest of the social-democratic left with no reason to exist. The DSA has succeeded in building the kind of “socialist”-flavored appendage to the Democratic Party that the reformists, each with a slightly different formula, all aspired to. They are being devoured by their own opportunism. In this context, Socialist Action (SA) has remained relatively stationary, wedded to old-style reformism and popular-frontism. Where most opportunist leftists sought to hop on or chase after Bernie Sanders’ bandwagon as he ran for the Democratic presidential nomination in the 2016 elections, SA maintained its traditional call for a labor party – on a reformist program. Its 2016 presidential election platform called to “tax the rich and corporations” just like the rest of the reformists (and many liberal Democrats). It did not call to expropriate the bourgeoisie or for socialist revolution, just a ritual invocation to “Abolish capitalism! For socialism!” In a kind of political doppler effect – a red-blue shift – as the rest of the reformists moved closer to the Democrats, just by staying stationary Socialist Action appears relatively more red. In reality, its program is pink social democracy. On the vital “Russian Question,” as Leon Trotsky and James P. Cannon called it, at every key juncture Socialist Action has lined up with imperialism, from Poland in 1981 to the USSR in 1991 and continuing today. In deeds it trampled on the Trotskyist program of defending the bureaucratically degenerated Soviet Union and other deformed workers states against imperialism while fighting for proletarian political revolution to oust the Stalinist bureaucracy. Poland was a key episode in the imperialist drive against the Soviet bloc, which led to capitalist restoration whose devastating consequences continue to be felt around the world. Today SA denounces China as imperialist and North Korea as capitalist while genuine Trotskyists defend them against imperialist threats and attack. And it’s not just words. When the chips were down, SA hailed its comrades’ direct and concrete role in carrying the bags for CIA-financed and directed counterrevolution. As we shall show below. Socialist Action originated out of the Socialist Workers Party (SWP) in the early 1980s. The SWP had in fact rejected the revolutionary program of Trotskyism in the 1960s, but in 1982 its maximum leader Jack Barnes finally declared: “We are not Trotskyists.” The Barnesites expelled those members who still felt attachment to the terminology of Trotskyism, if not to its program. Among those expelled, Nat Weinstein and Jeff Mackler and others who founded Socialist Action didn’t seek to recreate the revolutionary Socialist Workers Party founded in 1938 and led by James P. Cannon. Instead, they looked to the reformist SWP of the late 1960s and early ’70s, which built “peaceful, legal” antiwar movements in a “popular front” with bourgeois liberals. Mackler’s SA is still trying to do that today with the United National Antiwar Coalition. Allying with Ernest Mandel’s “United Secretariat” (USec), which falsely claimed to be the Fourth International, Socialist Action quickly show that it was an anti-Trotskyist, virulently Stalinophobic organization. 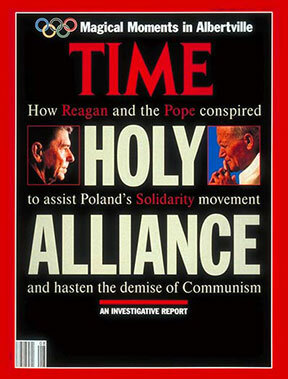 From its founding in December 1983, Socialist Action billed itself as the best builders of Polish Solidarność, the Catholic clerical-nationalist movement bankrolled and guided by the CIA and John Paul II, the Polish pope of counterrevolution. SA imitated the Solidarność logo in the masthead of its newspaper, Socialist Action. 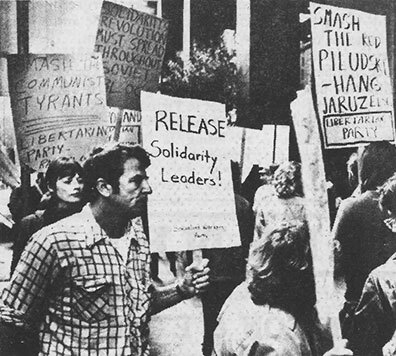 Based on the peasantry and layers of workers frustrated by decades of Stalinist bureaucratic misrule, Solidarność (often called Solidarity in the U.S.) was founded in August 1980. Over the next few months it congealed as an explicitly anti-socialist, pro-capitalist organization. Veteran CIA labor operative Irving Brown was invited to the September 1981 Solidarność congress which sealed the subordination of the anti-Soviet Polish nationalist outfit to U.S. imperialism. During 1981, Solidarność adopted a program of open counterrevolution, calling to dismantle the planned economy and for a “council of national salvation” that would include the Catholic Church and ally with International Monetary Fund bankers. That September, the then-Trotskyist Spartacist League (SL) warned: “Time Runs Out in Poland – Stop Solidarity’s Counterrevolution!” Solidarność opened an office in the New York offices of the United Federation of Teachers, headed by Albert Shanker, a rabid social-democratic Cold Warrior who thought that Richard Nixon was soft on Communism, advocated a nuclear first strike on the Soviet Union, and received CIA funding through the U.S. Agency for International Development. On 24 September 1981, as Solidarność held its inaugural press conference at the UFT, with immense publicity, the Spartacists held a demonstration outside, proclaiming “Polish Solidarność Agents of Counterrevolution” and “Social Democrats, AFL-CIO Front for CIA in Poland, Too.” The protest was denounced in an editorial by the Wall Street Journal (29 September 1981), titled “Communists and the AFL-CIO,” which defended the collaboration of the AFL-CIO leaders with the CIA against Communism. The bankers’ journal issued an ominous threat: “Anyone seeking to delegitimize [the AFL-CIO’s] performance in this realm should be aware of just how serious an attack he is launching.” See the pamphlet Solidarność: Polish Company Union for CIA and Bankers (October 1981) for more details. That December, in the face of the Solidarność bid for power, the Stalinist regime of Wojciech Jaruzelski, backed by the USSR, declared martial law and suppressed Solidarność. The genuine Trotskyists wrote, “Solidarność Counterrevolution Checked,” noting that the Stalinists “were forced to take measures defending historic gains of the proletariat” (Workers Vanguard, 18 December 1981). This followed the Transitional Program, the founding document of the Fourth International, which described the conditions in which Trotskyists would engage in a “united front” with the Stalinist bureaucracy “against open attack by capitalist counterrevolution,” while calling for a proletarian political revolution to oust the bureaucracy. “Any other course would be a betrayal,” Trotsky wrote. Nat Weinstein demonstrated for Solidarność together with right-wing Libertarians and other virulent anti-communists. In contrast, Socialist Action founder Nat Weinstein distinguished himself by picketing with right-wing Libertarians who called to “Smash the Communist Tyrants” and “Hang Jaruzelski.” Solidarność took power in 1989-90, carrying out capitalist restoration through “shock treatment” assaults on the working class, including shutting down the Gdansk shipyards where it was born. The catastrophic results included chronic mass unemployment and emigration, the banning of abortion, brutal oppression of women and gays, the revival of vicious anti-Semitism, anti-communist bans and fascistic witch hunts. In November 1989, U.S. president and former CIA chief George Bush, welcoming Solidarność leader Lech Walesa, “jokingly” stated his “thanks to the AFL-CIA” for its help in supporting Solidarność over the years. The CIA/NED/AFL-CIO operation to smuggle equipment and supplies to Solidarność was carried out using the Swedish social-democratic government and its allied trade unions as a “labor” cover for support to capitalist counterrevolution. One such courier was Göran Jacobsson, a member of the Socialist Party, the Swedish section of the USec. 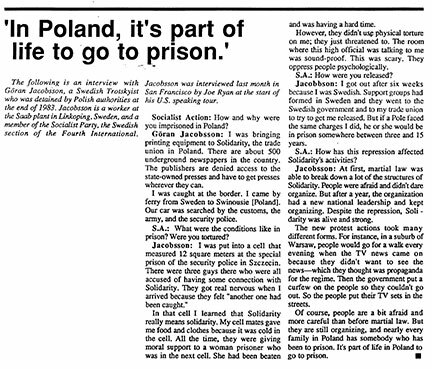 Jacobsson, acting on behalf of the LO trade-union federation, was detained for six weeks by Polish authorities when he tried to smuggle in printing equipment in 1983. SA published a laudatory interview with Jacobsson in Socialist Action (July 1986), where he said: “I was bringing printing equipment to Solidarity, the trade union in Poland…. I was caught at the border.” Socialist Action cheered this operative for U.S.-sponsored counterrevolution. Poland wasn’t the end of it. Socialist Action went on to support capitalist counterrevolution in the Soviet Union in 1991-92, hailing Boris Yeltsin’s pro-imperialist countercoup in August 1991. As yuppies, speculators, fascists and priests flocked to defend Yeltsin, who had become the spokesman for capitalist restoration, Socialist Action (September 1991) described the anti-Communist mobs as a “popular uprising.” It declared: “Many stood ready on the barricades, prepared to battle troops and tanks in the cause of democracy and a better life.” “Democracy and a better life”?! The counterrevolution that Socialist Action hailed led to a drastic fall in living standards (and life expectancy) for workers in the ex-Soviet Union. At the decisive hour, genuine Trotskyists stood at their posts, declaring “Soviet Workers: Defeat Yeltsin-Bush Counterrevolution!” (Workers Vanguard, 30 August 1991). In contrast, Socialist Action hailed “democratic” counterrevolution. In a 28 August 1991 radio interview, SA leader Jeff Mackler alibied the Yeltsinites, declaring: “The essence of socialist politics is democracy.” As Lenin stated in The Proletarian Revolution and the Renegade Kautsky (1918): “It is natural for a liberal to speak of ‘democracy’ in general; but a Marxist will never forget to ask: ‘for what class?’” In Mackler’s case, it is clear what class he is for: the bourgeoisie. 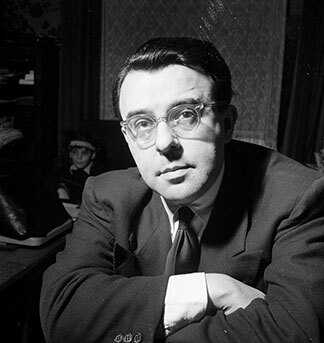 In the same interview, he flatly stated: “I agree with the bans on the Communist Party” in the USSR! What the USec did in Poland, which Socialist Action hailed, is the opposite of what French supporters of Mandel and Michel Pablo’s International Secretariat did in the late 1950s. As France was waging its ultimately losing colonialist war in Algeria, they organized one of the first clandestine networks, known as the porteurs de valises (the luggage carriers), to smuggle aid and propaganda for the anti-imperialist struggle waged by the Algerian National Liberation Front (FLN). In Poland (and elsewhere), the pseudo-Trotskyists carried the bags for their own imperialist rulers.